On February 8, 1997 I went to London to see the last performance of the musical 'Tommy', starring Kim Wilde as mrs. Walker. It was a fine performance, and after that very nice evening I went back to the hotel. Before being able to sleep, I watched some television and saw an episode of good old Top of the Pops. 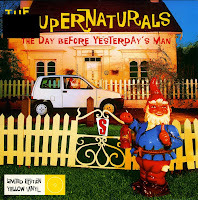 During this episode there was a performance by the Supernaturals, playing their current single 'The day before yesterday's man'. I'd never heard of the group, but I liked the song. So sure enough, the next day I went to the Virgin Megastore and got myself a copy of the limited edition yellow vinyl 7" single.